Welcome to the Pursuit Hunting website. The purpose of this site is to educate whitetail hunters about pursuit style hunting, which simply means using your knowledge of deer and deer sign to take the hunt to the deer rather than hoping the deer will bring the hunt to you. The rewards of pursuit style hunting are two-fold. First, you will see more deer. Second, as your knowledge and your woodsmanship skills grow, you will get the sense that you are an active participant in the natural order of things, rather than a mere observer. You know, as humans, it's our nature to want to control things. Whether its our work, our kids, or our spouses (good luck!) we are much more comfortable when we feel like we are doing something to make things go the way we want. When I started deer hunting, I approached it with that same mentality - I'm going to DO something to make the deer come to ME. I had it all figured out. With the help of all the latest gadgets, gizmos, sprays, powders, and assorted other stuff, I was on my way to becoming the greatest deer hunter in the world. The only problem is that the deer didn't get the memo about how they were supposed to cooperate. I spent more hours than I care to remember sitting up in a tree fantasizing about squirrels (easy now, this is a family site) magically transforming into huge ten pointers. Every once in a while a deer would blunder by, but I was basically counting on luck to see (much less shoot) a deer. Needless to say, I wasn't loadin' up the truck very often. My hunting "luck" changed about fifteen years ago when I met my hunting partner Ted Craddock, a.k.a. Rambuck. That's him wavin' at you. Ted has taken over 400 whitetails personally and has put friends and clients on hundreds more. The dude knows his stuff! Ted taught me that the key to consistently killing deer is to figure out where they are. Pretty simple huh? Unfortunately "somewhere out there in the woods" wasn't going to cut it. Okay, how about "walking down this trail?" Nope! "Freshening this scrape?" Nope! "Checking this rub line?" Wrong again! Boy did I have a lot to learn. Ted taught me that I could dramatically increase my odds of getting close enough to make a bow shot if I could figure out what they were eating. You see, deer are creatures of habit when it comes to their feeding behavior. He introduced me to the concept of the dominant tree. So what is a dominant tree? Well, simply put, a dominant tree is one that is producing fruit or nuts on which the deer are actively feeding at that particular time. Figure out which specific tree that is out of the thousands in the woods, and your chances of getting a shot at a deer will go way up. "Wait a minute," you say, "you're telling me I have to find one tree out of thousands? Isn't that like finding a needle in a haystack?" Yup and nope! Yes, you do need to find that one tree out of thousands, but it really is easier than it sounds. All you need is a little knowledge and the willingness to put some serious time and effort into scouting. Does it work? Absolutely! On average, only about 10% of bowhunters, nationwide, successfully harvest a deer during the entire hunting season. In contrast, last year, we kept detailed statistics on how often we had opportunities to kill a deer. When we were hunting a dominant tree, we saw deer within bow range 85% of the time. One of the biggest benefits of learning to find and hunt dominant trees is that the technique works anywhere there are mast-producing trees. With huntable private land becoming increasingly scarce, it's nice to know that you can go to a public hunting area and still connect with deer. Sure, your odds of taking a record book class deer are lower on public land where there is more hunting pressure, but with some practice, you will come to enjoy the challenge of finding that hotspot that may be under everyone's nose. Here is a video clip of an 8 pointer that I shot on public land in Illinois last season. He and about six does were coming to feed on a dominant tree. He stood forty yards away for about thirteen minutes before he finally walked over to the white oak tree and offered a good shot, which is what you see here. Note: to get the video to play, you have to click the triangle in the center of the frame then click the small triangle at the bottom left. We had two things in our favor that day. 1. We knew exactly where the deer was eventually going to go (notice the direction my stand was pointed). 2. We also knew that he wasn't going to smell us before he got there (notice the wind direction indicated by the wind sensor on the end of my stabilizer). I was confident in passing up several iffy shots and waiting for a good angle and a clear shot. Tomorrow we'll continue talking about dominant trees and how to find 'em. hi. just found your site and love it. i am from cumberland county,but moved to alabama in 2003but i still hunt my home state where i got my best buck last year in lincon county he grossed scored 157 and 5/8 he was a heavy rack ten pointer with two sticker points.love the info on the oaks, can't wait to read more! Hi Boker. Thanks for the note. I'm a plateau boy myself. Grew up (my wife might disagree) on Signal Mountain near Chattanooga. Love the hills. Congrats on the nice deer last year. Hope you can connect again this year. Despite there being acorns everywhere, the deer almost always hit certain trees much harder. It is just a matter of finding them. I would start by trying to figure out something about their travel patterns and concentrate your scouting for a dominant tree around those areas. As wet as it has been, you should be able to see which areas have the highest concentation of walk sign. It might not be a trail, per se, but you might find areas ten or twenty feet wide where the leaves have been trampled. Typically, if you can find the fresh walk sign, they will be keying in on a food source in the area. I woud also look for any fresh scrapes and rubs and check the trees nearby. Where I'm hunting, the majority of the fresh buck sign is close to a dominant tree. Also, use your ears. Deer seem to prefer nuts that have just fallen. Listen for the trees that are actively dropping nuts. Gotta go scout. Good luck to you. well i did as you had said and found a good oak dropping acorns.it had plenty of walk sign under it,as i looked the area over i also found a small rub near by.i set up there saturday after noon, i saw a small spike.the first buck of the year! LOL though he wasn't even close to the 18 to 20 inch wide eight i had scoped out at the end of summer just down the road from my farm .hes a start. thanks so much for the info. Good job Boker! Sounds like you are putting in the scouting time. That's what it takes. Remember that once you find good walk sign, that only tells you that deer are travelling in the area. The key is still to find the tree with several piles of fresh (still wet) droppings underneath. That tells you the deer have been feeding there within the last 12 - 24 hours. If the nuts are still dropping, chances are very good they will return. The bucks really haven't been doing much rubbing in my area for the past three or four weeks, since about the time they cast their velvet. When you start seeing some large rubs, look for a dominant tree nearby and see if you can nail that big dude. Shoot me a photo when you get him. I'd love to post it. i would love to send a pic,that would mean i did it! !until that day comes.how about a pic of the deer i got last year? do u still hunt in tennesse? would love to here about your best tennesse buck,or just your best buck? This year I'll probably hunt primarily in Tennessee and a little bit in Alabama. Photo and story about my biggest deer so far (killed in Tennessee) can be seen by clicking on the link titled Chestnut Oak Buck at the top right of the page. There is video of another pretty nice one that I killed last year in the post Rattle and Roll 'Em. Send a photo and story of your hunt to cpanderson@comcast.net . If it illustrates the techniques that I talk about here, I'll post it. hi pursuit,those are really great deer.i was really hoping to get a shoot at one like that this bow season so far i haven't.i have another question if you don't mind my farm has several persimon trees .most of the fruit is on the ground now,with very litte deer sign,in years past i have hunted this trees with great success.Do you think its the acorns making the deer pass on the sweet stuff? Figuring out when deer will hit the persimmons is always a challenge. I did an article last year about a spot that had white oak acorns and persimmons virtually side-by-side. The deer walked right over the persimmons to get to the acorns. There is a link to the article "Acorns vs Persimmons" in the On The Hunt article listing. I'd keep a close eye on the persimmons for fresh sign, because the deer will likely hit them at some point and they will be hot for a couple days until the fruit runs out. thanks for the info. i'll try to keep a close eye on those persimmon trees.my food plots started out really well.but this year there was to much rain,unlike past years.i do have a fair stand of winter wheat and green beans,but the turnips,winter peas,and clover didn't do much.what do you plant or do you? I got the impression that most of our deer fed in the corn fields. Will there also be a dominant tree somewhere? That depends on where you hunt and the time of year. If there are oak trees nearby, I can almost guarantee that that's where the deer will be during the fall when the acorns are actively dropping. Deer seem to naturally seek out the hightest quality foodsource available and acorns easily top corn in that respect. Does Pursuit Hunting still make or sell the Product "Tiger Whiskers" wind sensor? We do, but were making some changes in our distribution. If you will email me at chris.andersonatpursuithunting.com (substitute the @ symbol) I'll be happy to help you out. Oh if I only knew some of this years ago. Ive been scouting a lot and have 2 dozen groups of persimmons on my gps. If one of these seems to be a dominant tree, how long do you recommend one hunt it? Do you concern yourself with your sent if you hunt it too many days in a row? You have a wonderful website and many of my friends have been directed to it. You can definitely over-hunt a dominant tree. I've noticed that I generally see the most deer the first time I hunt a spot. I try to have several dominant trees picked out so that I can jump around and not hunt a particular spot more often than every couple days. Conditions should impact your decision too. If the wind isn't right, there is no point in going in and messing up that hunt and future hunts. Persimmons sometimes seem to go in and out of favor with the deer, depending on what else is available. I've seen the deer feeding on a tree early in the season, abandon it when the acorns start falling, then come back and feed on the fruit that has been laying on the ground for weeks. I would make a regular routine of checking any group of persimmons that has a good amount of fruit because you never know when the deer will decide to feed on 'em. just found your blog and am very impressed. I've killed hundreds of whitetails and have evolved into somewhat of a Johnny acornseed, planting sawtooths and English oak hybrid acorns all over the country. I wish to email you off of this post. Could you please send me your email address? I would like you to review a product for us. hey pursuit, hunting season it starting to wind down here in Mississippi, I've read just about all of your post and loved them, but I was wondering about the scouting for dominant trees. I understand if you are hunting on public land and you are able to scout for dominant trees before the season starts, but once or twice a year I go hunting on a large 1200-1500 hundred track of private land with considerable hunting pressure, although none of the real pressure is ( in the woods) so to say it's mainly foodplots. do you have any tips or advice that you might could lend me to help my hunting success? keeping in mind I just get dropped off in certain areas where I. walk to wherever it is I'm looking for. just any tips or advice on how to find a good spot climb? Mississippi - That situation sounds perfect for hunting dominant trees. Pressure around the foodplots will keep the deer in the woods during daylight hours. As a general guideline, I would concentrate my scouting in areas where the deer are likely to travel through or stage prior to entering or after leaving the foodplots. I would look for areas with good cover, mature hardwoods, and some type of funneling terrain feature within 400 - 500 yards of the foodplots and then then do my detailed scouting there for specific dominant trees. If you don't have a lot of choice in where you get dropped off, I would first look for any type of fresh travel sign (tracks, trails, disturbed leaves, etc) and hopefully use that to guide me to a productive area. If it were me, I'd spend my time scouting until I found something worth hunting, even if it meant spending very little time in the stand. I'd rather spend 30 minutes hunting an area the deer are using rather than 4 hours hunting somewhere they aren't. well pursuit I did not get my ( swamp donkey ) so to say this weekend, but I did get some meat for the freezer. I got dropped off right in between a pine plantation and a strip if hardwoods with a food plot someone else was hunting about 300-400 yards away. I did as you said and found a dominant tree( the one I found was a white oak) which must have had 25 piles of deer droppings underneath it, and rubs and scrapes all around it. I saw a bunch of does and small bucks, but not the big boy I was looking for... on the last day at about 5:25 ( last light) and decided to get some meat for the freezer. 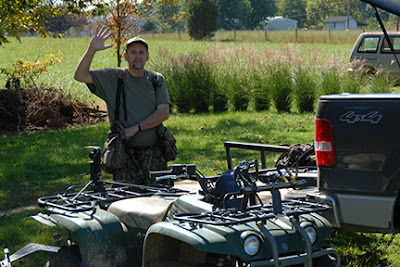 o and by the way the guy hunting the food plot 400 yards away from me did not see a deer, when he asked how I knew about how hunting the dominant tree and how it drastically increases your odds of seeing deer and getting them close enough for a bowshot I simply reffered him to your website. every deer I saw came within 20-30 yards. all I can say is THANKS! I will definetly be a dominant tree hunter from now on! Awesome dude. I love it when a plan comes together. Congrats! Thanks for sharing your story and spreading the word about the site. I've never found a tree that was a dominant tree every year. There are lots of factors that influence whether a given tree will produce acorns in any particular year. Check out the article The Dominant Tree - Part 3, Size Does Matter for an overview. That said, you will find that some trees are fairly consistent acorn producers from year to year. If they are located in areas with a good amount of deer movement (like saddles, funnels, or nearby fields or cover) they will be dominant trees pretty regularly. I'm a little iffy on this dominant tree thing. however, seeing some of the bucks you have killed on other articles, I will give it a try next bow season. just for curiositys sake are their foodplots where you hunt? if so do you hunt them? Some of the properties I hunt have foodplots that were planted by others. Most of them don't though. I've only hunted a foodplot a couple times and really didn't enjoy it much. I'm not knockin' it if that's what you enjoy, but it's not my cup of tea. For me, the essence of deer hunting is in learning about their behavior, reading and interpreting the clues they leave, and figuring out the puzzle of where they are. When I hear the gentle crunch of leaves as a deer approaches through the woods, my hunt has been successful, regardless of whether I pull the trigger. I've been scouting a piece or property with little success. I came scross your blog and gave the dominant tree idea a try this evening. I looked at the topo map and found a nice steep spur, leading up from the creek to a bedding area (off the property), about 150 feet of inclination from the water. I found a slick trail a out 2/3 up, and a big red oak tree with fresh rubs, scrapes, broken acorn caps, and an abundance of fresh droppings! There are good trees amd approaches for nearly any wind conditions. I cant wait for saturday morning!